A senior police official told on condition of anonymity that eight bodies from Nairobi’s slums had arrived at the city morgue. Nairobi: Tensions remained high in Kenya on Sunday after 11 people died in violent protests and the opposition stood by its demand that the re-election of President Uhuru Kenyatta be overturned. While much of the country was calm, stone-throwing supporters of defeated veteran rival Raila Odinga squared off on Saturday with security forces in opposition strongholds in the country's west and the slums of the capital Nairobi. A senior police official told AFP on condition of anonymity that eight bodies from Nairobi's slums had arrived at the city morgue, and an AFP photographer saw the body of a young girl whose family said she had been shot in the back while watching the protests from a balcony. 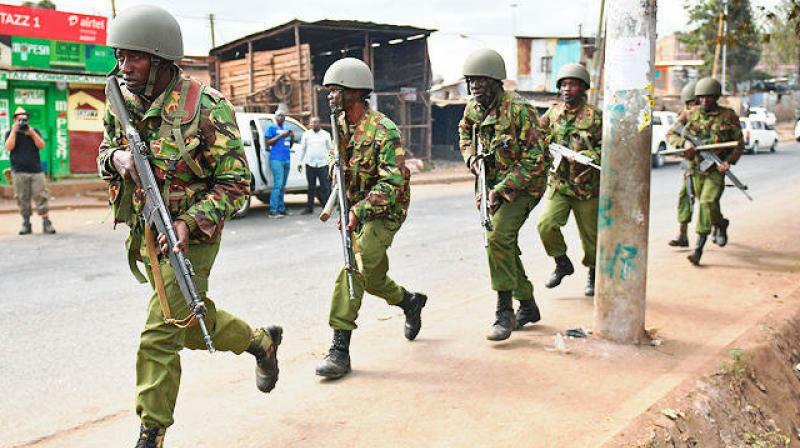 In western Kenya, a police officer said a man had been killed during a protest in the town of Siaya and local government official Wilson Njega confirmed one person had been shot dead in protests at Kisumu. It remains unclear what the next move will be for Odinga's National Super Alliance (NASA) opposition coalition, but party leaders have said they will neither back down nor take their grievances to court. "We will not be cowed, we will not relent," NASA official Johnson Muthama told reporters on Saturday. He and other opposition stalwarts insist that elections held on Tuesday were manipulated. They also accuse the police of cracking down on protesters in an effort to force the coalition "into submission." Addressing the media on Saturday, Muthama held up a bag full of bullet casings he claimed were used by security forces to kill "innocent Kenyans" taking part in street demonstrations after the Friday night announcement of Kenyatta's victory. "We wish to assure the people that we have the will, the determination, and the means to make sure your vote will count at the end of the day," he said. Criminal elements: Kenya is no stranger to post-election violence, and scars still run deep from a disputed 2007 vote which led to two months of ethno-political clashes, leaving 1,100 dead and 600,000 displaced. But while those riots stretched across Kenya, this year's unrest is limited to a handful of areas. Interior Minister Fred Matiangi downplayed the clashes, calling protesters "criminal elements" and saying there had been no casualties. "The police have not used live bullets on any peaceful protesters," he said. Odinga, 72, has not yet addressed his supporters after losing his fourth shot at the presidency. He believes elections in 2007, 2013 and now 2017 were snatched away from him. He laid out accusations of a massive hacking attack on election commission servers, and said the opposition had evidence the true results which showed him to be the winner were being hidden. The electoral commission (IEBC) denied the accusations, and argued his supporting documents were riddled with arithmetic errors and originated from a Microsoft database while the electronic tallying system was based on Oracle. The IEBC denials have been backed up by international monitors along with Kenyan election monitoring group ELOG, which said their 8,300 observers and parallel tallying operation found no fault with the result. And former UN chief Kofi Annan, who helped mediate the 2007 crisis, congratulated Kenyatta on his win and urged Odinga, "a courageous defender of democracy", to turn to the courts with his grievances. Exacerbating exclusion: Politics in Kenya is largely divided along tribal lines, and the winner-takes-all nature of elections has long stoked communal tensions. Odinga's ethnic Luo supporters and their allies from other groups believe they have been denied political power by elites from the Kikuyus, the same ethnic group as Kenyatta, the country's biggest community. "President Kenyatta, unlike his first term, must include everyone in his government," wrote the Daily Nation in an editorial, warning that limiting power to his tribal allies was "exacerbating exclusion and creating resentment and disillusionment." In his acceptance speech Kenyatta, 55, urged Odinga and his supporters to "work together so that we can build this nation together". "Let us be peaceful We have seen the results of political violence. And I am certain that there is no single Kenyan who would wish for us to go back to this."